Perfectly suited for luxury year-round stays, this gorgeous 2-storey home oozes charm, style and home comfort. Situated within the privacy and serene parkland of the recently converted ‘Parco Ameno’, the gated villa complex promises effortless lake views and exclusivity. Equipped with onsite private parking, a lovely shared outdoor swimming pool and Astro turf tennis court, this ground floor Duplex with small private garden invites you to come and soak up La Dolce Vita! Internally the apartment has been beautifully decorated throughout, and lets you easily relax; with lake views serving as the perfect accompaniment to a spacious open plan Living room with Kitchen Diner. Equipped with a host of home comforts, including a music stereo and a SAT TV with English and German channels, the Duplex lets you kick back and enjoy quality moments together. The lower ground floor Master Suite is reached by a romantic spiral staircase, and offers an ambient spot-lit hideaway for those tempting holiday slumbers. The lower ground floor en-suite bathroom is a great touch too, whilst back on the ground floor level you will find a useful Service WC and sink. Outside, an awning offers some welcome shade to the private dining terrace with BBQ, whilst to the rear of the home, a quaint private garden provides an idyllic setting for savouring alfresco lake view breakfasts and drinks. The shared landscaped grounds also boast magnificent views; for a serene natural setting perfect for year-round holiday stays. The delights of Germignaga are within easy walking distance (1 km away). Here guests can enjoy a host of local shops as well as a bank, post office and a semi-pedestrianised area. Close by, the lake town of Luino (3/4 km away) provides a wider selection of amenities; including supermarkets, a tourist office and disco. Its quaint harbour, pretty cafes, bars, authentic restaurants, lido and ferry service are also a popular draw for many. The lakeside resort is also home to a famous weekly market and a scenic bucket lift up to Sasso del Ferro. From this gorgeous northern shore setting, Germignaga’s local beach with its Acquarya Sailing School is also close by. A wide selection of hiking and cycle routes, water sports, boat rentals, island tours, safari parks, theme parks, ski resorts and sightseeing opportunities also wait on the doorstep of Lake Maggiore. The 1 bed retreat provides the perfect romantic bolthole for 2. Guests can easily savour tempting alfresco feasts out on the private sunny dining terrace with BBQ, as well as enjoy the small private garden to the back of the holidayhome (ideal for relaxed lake view breakfasts). The beautiful shared parkland setting invites guests to relax, enjoy a stroll, play some tennis and take a splash; with an Astro turf tennis court and sunny resident outdoor swimming pool on hand for your enjoyment. The residence offers a private and protected parking space. The beautiful residence is just 1 km away from the old town centre of Germignaga. Here, a selection of local food shops will easily keep the kitchen cupboards full. A range of local cafes and authentic eateries and restaurants are also on hand for those wishing to dine out. The town also offers a bank, post office, some useful convenience stores and a semi-pedestrianised area for shopping safely. Guests looking to take up sailing lessons can also arrange some with the local Acquarya Sailing School (which is established along by Germignaga’s small local beach, close to the car park). A larger supermarket and shopping centre is also just a few km away by car, whilst Luino is just 3-4 km down the road. Here a beautiful harbour, string of eateries, restaurants, food shops and a weekly market (open each Wednesday from 8:30 – 13:30) are in full swing. Pretty Luino also offers carefree access around Lake Maggiore via its frequent ferry links. For those seeking a panoramic lake view photo opportunity, then the local views from Le Serenelle and from the Sasso del Ferro bucket lift in Luino will be just the ticket too. The setting of this north-western shore holiday home makes it ideal for enjoying a tranquil and authentic stay, alongside hiking, cycling and dipping into Maggiore’s main tourist hot spots. 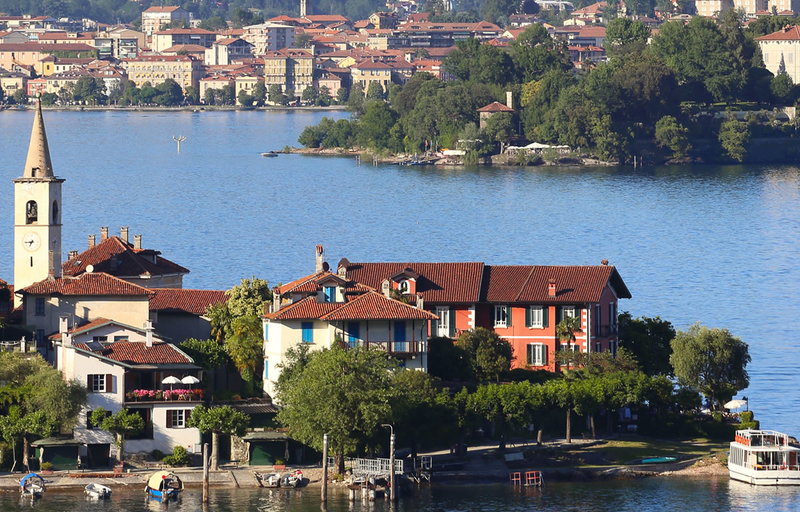 Lake Maggiore is very well known for its water sport and sailing clubs, Swiss Italian Alp ski resorts, wildlife parks, fine botanical gardens and world-class villa attractions; so whatever season you choose to come and visit there is something for you!